Essential reading for an astounding summer of sport; If you've ever wondered what makes a champion, Bounce has the answer. What are the real secrets of sporting success, and what lessons do they offer about life? Why doesn't Tiger Woods "choke"? Why are the best figure skaters those that have fallen over the most and why has one small street in Reading produced more top table tennis players than the rest of the country put together. Two-time Olympian and sports writer and broadcaster Matthew Syed draws on the latest in neuroscience and psychology to uncover the secrets of our top athletes and introduces us to an extraordinary cast of characters, including the East German athlete who became a man, and her husband - and the three Hungarian sisters who are all chess grandmasters. 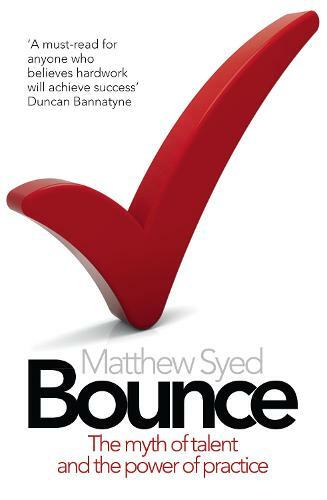 Bounce is crammed with fascinating stories and statistics. Looking at controversial questions such as whether talent is more important than practice, drugs in sport (and life) and whether black people really are faster runners, the mind-bending Bounce is a must-read for the hardened sports nut or brand new convert. Even if you agree with the premise of "Myth of Talent and the Power of Practise" 100% or not, it is a very interesting book. All the theories are backed up with sound evidence and examples of subjects. Superb take on the myth of talent from a great source and author. Great for any willing sportsperson or a student like myself!